LP Breathing Air Hose - August Industries Inc. Highest quality low pressure air hose used for most surface supplied breathing air applications. 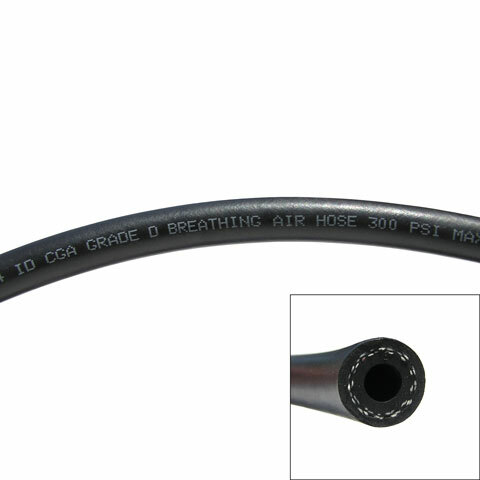 The tube and cover are RMA class A rubber compounds.This hose has been tested and certified to meet or exceed all standards for class C Breathing Air Hose as set forth in 30CFR, Part II, Sub-Part J, 11.24.7. Heavy construction with two ply reinforcement. For air service, 300 PSI. This hose is sold by the foot and should be used with our replaceable hose ends listed for this service,in this section of our website.